We are coming towards the end of this trip. We will go back to NL on December 20th. In the meantime, Eugénie has returned to Burkina. The container we sent at the end of September has arrived. She is in charge of sorting out the second hand clothes and other miscellaneous items we have gathered during the year. We have been able to provide 650 bee hives to women and men in the villages. The harvested honey is bought by ASAP. We have found out that only 50 to 60% of the hives were colonized. We have first made an audit in some villages with a specialist and In order to improve this situation we have started an additional training of the beekeepers. This is a 2 day training with some practical work during the night. The first one was at the LAP where we have 22 hives. We started with some theoretical training. 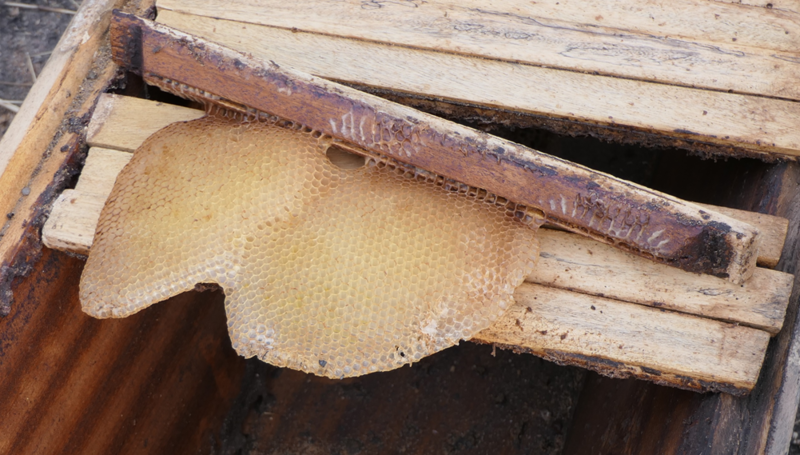 The first surprise was to find out that at one of the apiaries of 12 hives only 4 were colonized, when just before the harvest of honey in October, 10 were with bees. The trainer thinks that we took out too much honey out of the hives, not leaving enough for the bees at a time when there are very few flowers around. Hives taken away from the apiary. All the strips needed to be cleaned from old wax, before the hives where smoked with dry fruits and leaves from local trees. Strips of embossed wax are cut to put in the grooves of the wooden strips. The wax strips are glued on the wooden strips with wax. Discussion between the trainer and beekeepers about where the best place for the hives would be. All the participants where very happy about the training and now they have to go back to their own apiary and practice what they have learned. Second year students busy upturning the pile of compost prepared 2 weeks ago. The compost will be used in the vegetable garden. It is the period when there are a lot of bush fires. Some people started a fire just outside the fence of the LAP. With the help of the teachers we were able to stop it. We were lucky that there was almost no wind. This also happened last year. People do this only to chase little ruminants. We have done some early fires ourselves before the grass was too high and too dry. But we did not do this close to a planted field of hibiscus (bissap).